This is a history of the Otago/Southland Society since its inception in 1944. 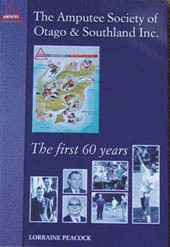 Published in April 2004, the 146-page book contains six chapters: The Business of Meetings, The Southland Link, The Social and Sporting Aspect, Of Finance and Welfare, Conference Hosting, The Dunedin Limb Centre, and Rounding Off 60 Years. The book is available free-of-charge and can be obtained from the Otago & Southland Coordinator.